Mumbai: India is the fourth largest beer consumer in the Asia-Pacific region by volume—but as individuals, Indians are laggardly drinkers of the amber fluid, ranking at the bottom of the barrel among the world’s top 30 beer markets. Together, the nation’s 1.2 billion population consumed 20 million hectolitres of beer in 2012—but that’s just 1.6 litres per person compared with 37 litres in China, 31 litres in Thailand, and 30 litres in Vietnam, according to a new report, Beeronomics 2013, by UBS Global, a financial services and corporate advisory firm. The report, a copy of which was shared with Mint by UBS, attributed the low per-capita consumption to affordability, poor availability and strict regulations. “Beer is currently targeted at the higher middle and middle-income demographics in India. 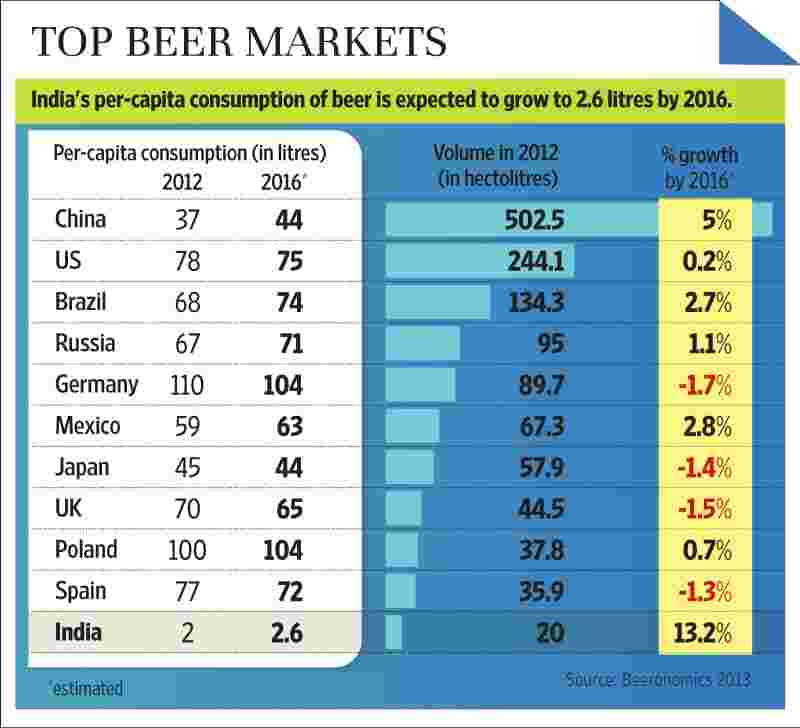 We estimate that of the top 30 global beer markets, India has the lowest affordability of beer relative to average GDP (gross domestic product)," said the UBS report. According to the report, India is the only BRIC (Brazil, Russia, India China) country where a beer is more expensive than a Big Mac. “Furthermore, on a unit/alcohol content basis, beer is 7-8% more expensive than spirits," in India, the UBS report said. The report noted that the cost of beer is much higher in India than all other emerging markets when compared with the average income of consumers. On average, it requires 54 minutes of work to buy 500ml of mainstream beer in India compared with the global average of 20 minutes, and 9 minutes’ work in China, the Beeronomics report said. Availability is another issue: there is one licensed outlet per 18,000 Indians, compared with one per 300 Chinese, said the UBS report. In April 2011, Karnataka raised the tax on spirits while leaving the tax on beer untouched—the first time there were different tax rates on different alcoholic beverages. “We believe the lower tax rate for beer will be the catalyst for growing consumption, which is the key reason for our long term positive bias on the sector," the UBS report added. However, the growth estimate is lower than the domestic industry’s growth forecast of 15%. “It’s very difficult to predict the market growth for beer in India as there is always uncertainty on the taxation front," said Kalyan Ganguly, managing director, United Breweries Ltd (UBL), the country’s largest beer maker by sales and revenue. UBL, the maker of Kingfisher beer, and SABMiller India Ltd, which owns the Haywards and Foster’s brands, will remain the top firms in the Indian beer market. These companies currently enjoy a market share of 55% and 23% respectively, according to the UBS report. Ganguly said the growth projections would “always depends on government policies in different states". “Since price elasticity in the market is high, every time the governments increase the tax on beer, sales are instantly affected," said Ganguly. Liquor is taxed by state governments; hence the tax, mainly excise duty, varies from state to state. Since alcohol is one segment from which all state governments expect a substantial chunk of their tax revenue, the tax on it is hiked unfailingly in the annual budget, and new duty structures are introduced during the year. Along with restrictions on pricing, governments also control the distribution of alcoholic drinks in the market. Excise duty per litre of beer is the highest globally, and beer is taxed higher than spirits. Tax rates differ by state, ranging from a low 15% to 43% (in Maharashtra). In addition, a ban on advertising alcohol makes premiumization and innovation a challenge, the report said. The UBS Global Beer Model forecasts volume, sales and EBIT (earnings before interest and tax) by company for 78 countries to 2016 and covers 97% of global beer volumes. It predicts a global beer profit pool of $43.6 billion by 2016.